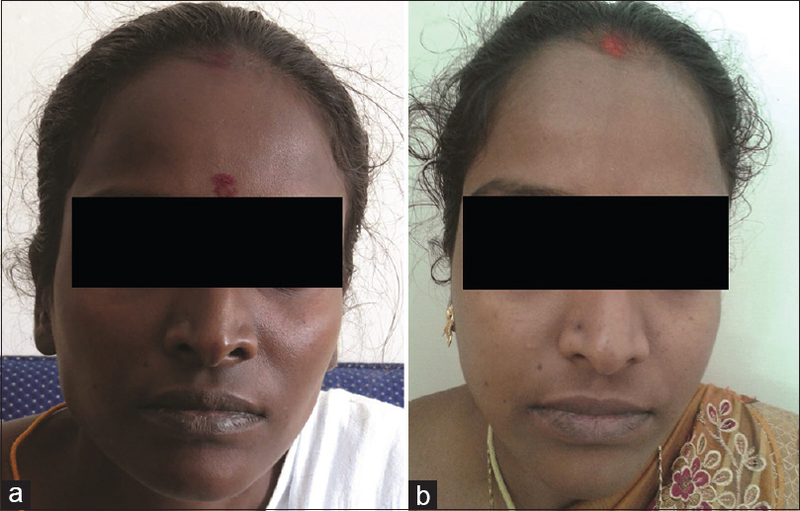 Scrub typhus is one of the most common undifferentiated fevers in South India. Scrub meningoencephalitis commonly presents with a severe headache and altered sensorium, along with fever. Sometimes, it is associated with seizures and focal neurological deficit. The cerebrospinal fluid analysis shows lymphocytic predominance with elevated protein and normal glucose. Tubercular meningitis is a common differential diagnosis. Prompt treatment with doxycycline is associated with favorable outcome. Tuberculosis (TB) remains one of the world's deadliest communicable diseases. In 2013, an estimated 9.0 million people developed TB, and 1.5 million died from the disease. The International Standards for TB Care (ISTC) were formulated to develop uniform guidelines for ensuring the delivery of widely accepted level of care by all healthcare workers in managing TB patients or those suspected to have TB. In India, the quality of care for TB patients receive varies considerably and often is not in accordance with the international standards. In this article, we provide an overview of the recent standards for TB care in India (STCI). These standards were developed after a national level consultation meeting involving over 120 national and international experts, these have been supported by the World Health Organization guidelines pertaining to TB care and are duly approved by the Central TB Division, Ministry of Health and Family Welfare, Government of India. The STCI has outlined 26 standards (diagnosis: 1–6; treatment: 7–11; public health: 12–21; social inclusion: 22–26) for effective prevention and control of TB in India. These standards need to be widely disseminated to all stakeholders to ensure universal access in quality TB care is available to all patients. The community health providers (both private and public), and governments should work as partners with a view to improve TB care and enhance the effectiveness of the healthcare process so that the ISTC is objectively implemented in day-to-day practice. Background: A formal evaluation of the Postgraduate (PG) training program has not been previously carried out at Pondicherry Institute of Medical Sciences. An evidence-based participatory approach was considered important to identify activities and to improve the training program. Population: Important stake holders to the PG training program including PG students, faculty in the Department of General Medicine, Faculty of Specialty Training the PGs, PG program administrator, and representative from the educational unit of the institution participated in the program evaluation (PE). Methods: The strategic planning (SP) exercise consisted of three activities. (1) A rapid assessment of present status by an anonymous cross-sectional survey of all identified stake holders (2) presentation of the results of the survey and discussion on different dimensions of PG training (3) a situational analysis of strengths, weakness, opportunities, and threats (SWOT) to develop an evidence-based recommendations on the definite steps to be under taken to improve the program. Results: There were 25/28 (89%) identified stake holders participated in the exercise. Through the exercise, consensus was obtained to broaden the training objectives to include seven competencies necessary for PG student. The overall satisfaction with training was 80.5% (95% confidence interval [CI]: 74.3–86.7). However, there were five responders (20% 95% CI: 9–39) who scored <80% for overall score. It identified 15 definite steps to strengthen the program in the dimensions of (1) educational resources and inputs, (2) educational interactions and postings, and (3) student evaluation. Conclusions: Participatory research, including PE and SWOT analysis are valid tools, which can be used to understand the present status and identify activities as for evidence-based SP in academic medical institutions. Introduction: Impaired fibrinolysis and low-grade systemic inflammation are postulated to be associated with the pathogenesis of type 2 diabetes mellitus (T2DM) with its micro and macrovascular complications. However, this mechanism is complex and poorly understood. 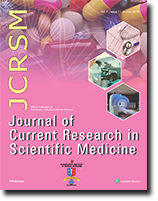 Materials and Methods: Fasting plasma glucose (FPG), plasma fibrinogen, serum high-sensitivity C-reactive protein (hs-CRP), and lipid parameters were measured among eighty, nonobese, adult type 2 diabetic males (age: 40–65 years) (without complications [n = 40, Group 2], with retinopathy [n = 16, Group 3], with hypertension [n = 24, Group 4]), and compared with age- and gender-matched healthy controls (n = 40, Group 1). Results: The mean age of subjects in Groups 1, 2, 3, and 4 were 51 ± 7.2, 49 ± 5.3, 51.5 ± 7.2, and 49.3 ± 5.3 years, respectively (P = 0.33). Fibrinogen, FPG, and hs-CRP were significantly higher among diabetics than controls (P < 0.001). 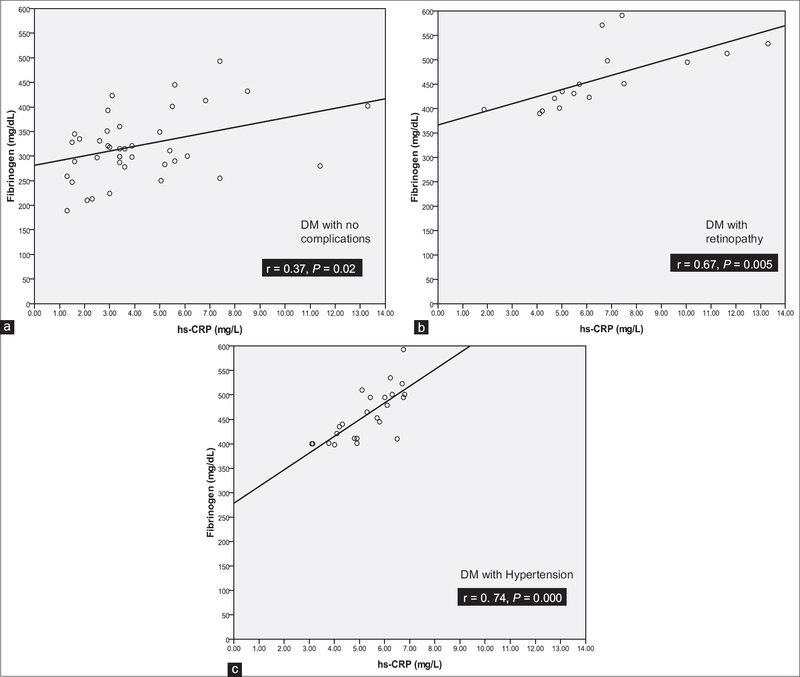 Fibrinogen was found to be significantly higher (P = 0.01) among diabetics with complications than without complications, though the results were similar between retinopathy group (Group 3) and hypertension group (Group 4) (462.3 ± 63.9 vs. 459.1 ± 53.3 mg/dl, respectively, P > 0.05). Significant positive correlation was noted between fibrinogen and hs-CRP among Group 2 (r = 0.37, P = 0.02), Group 3 (r = 0.67, P = 0.005), and Group 4 (r = 0.74, P = 0.000). On linear regression analysis, the association between fibrinogen and hs-CRP was found to be significant among all diabetic subgroups. Association of fibrinogen with lipid parameters was inconsistent in all subgroups. Conclusion: Fibrinogen may be considered as an inflammatory biomarker in T2DM, and fibrinogen-lowering agents may be useful in lowering the morbidity and mortality. Context: Infections associated with different Candida species have increased over the last decade especially with nonalbicans Candida. Species identification and antifungal susceptibility are vital for treatment and management of Candida infections. Virulence factors, including biofilm formation (BF) and secretion of hydrolytic enzymes have been demonstrated in Candida albicans and few other nonalbicans Candida. Aim: The aim of this study was to speciate and detect virulence factors of different Candida species isolated from a clinical specimen. Methods: All clinically significant Candida species isolated during the study period from various clinical samples were speciated by standard phenotypic methods and using the chromogenic medium. 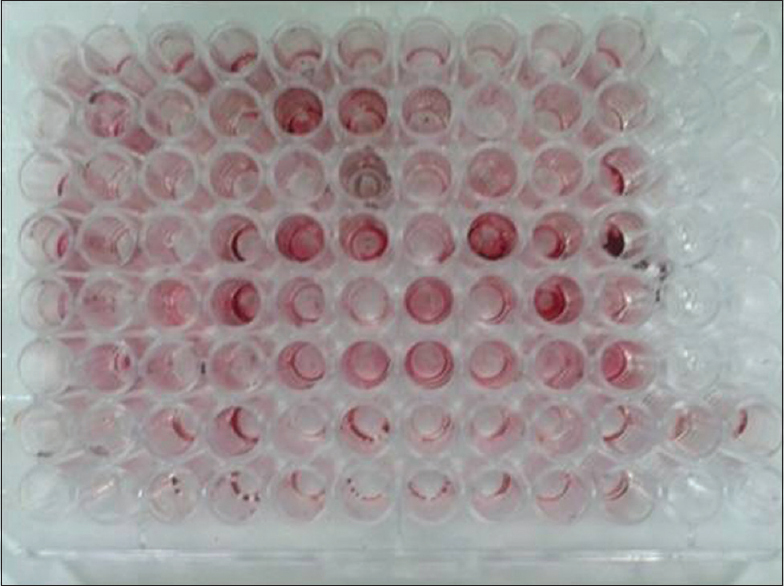 BF, Phospholipase and protease activities were determined by tissue culture plate method, precipitation, and bovine serum albumin agar medium respectively. Results: C. albicans was the most common species isolated followed by Candida tropicalis and Candida krusei. 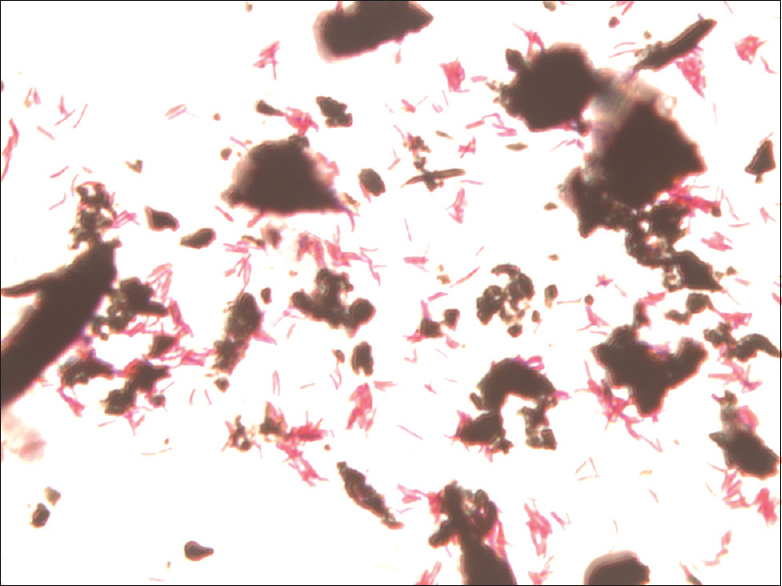 Chromogenic medium (CHROM agar Candida) was found to be 92% specific for identification of Candida species. BF was observed more in urine isolates of C. tropicalis followed by C. krusei. Phospholipase activity was seen only in C. albicans, whereas protease activity was observed in all four species of Candida but most commonly in C. tropicalis. Conclusion: Rapid identification and speciation of Candida species is essential in guiding appropriate anti-fungal therapy. CHROM agar Candida is a simple and rapid test for speciation of Candida; however, when used along with other phenotypic methods they give more reliable results. Detection of virulence factors in Candida species might indicate invasiveness. Background: The emergence of endogenous flora as a cause of hospital acquired infections in patients admitted in Intensive Care Unit (ICU) is of concern. They pose a serious therapeutic challenge, as most of these organisms are multidrug resistant. Methodology: Sterile moist swabs were collected from patients prior to admission to ICU from the anterior nares, throat both axilla and groin. Patients were monitored every day for the full length of their stay for detecting any signs of infection. In case of infection, routine cultures were done and reports were reviewed. The results were correlated with the screening results and analyzed. Results: Of the 100 patients who were screened, 10 patients had clinical infection caused by Acinetobacter baumannii. Among these 10 patients, 7 of them had their antibiotic sensitivity pattern similar to that of colonizers. Conclusion: Screening for multidrug resistant organisms, prior to admission to ICU followed by effective decolonization may prove to be effective to curb the infections caused by these organisms. Background: Trauma is one of the major clinical indications for radiological investigation, and this often comes to the fore during hospital care of patients involved in motorcycle crashes. The aim of this study is to highlight the pattern of medical imaging utilization and spectrum of radiological findings among adults presenting with motorcycle-related injuries (MCRI) in a tertiary health facility in the South-Western Nigeria. Patients and Methods: A cross-sectional descriptive study was carried out prospectively between August 2011 and July 2012. The study population included adult patients referred for investigations at the radiology department following involvement in motorcycle crashes. Appropriate radiological investigations were done, and imaging findings were reported by radiologists. 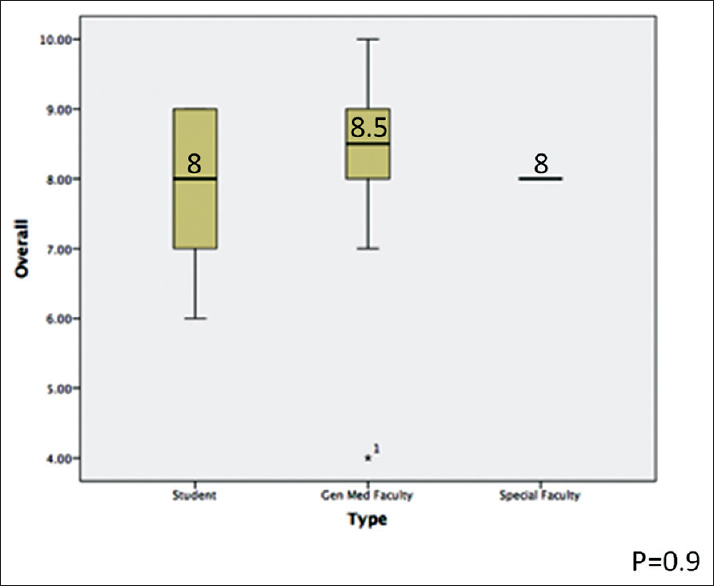 The data was entered into a spreadsheet and analyzed using SPSS version 16.0 for windows, Chicago, USA Inc. Results: A total of 150 patients were recruited into the study out of which 119 (79.3%) were males and 31 (20.7%) were females. There were 74 (49.3%) motorcycle riders, 55 (36.7%) pillion passengers, and 21 (14%) pedestrians. The limbs (n = 92, 61.3%) were the most imaged site in the body followed by the head (n = 78, 52.0%). Plain radiography (n = 113, 75.0%) was the most utilized radiological investigation among the study population, followed by computed tomography (n = 65, 43.3%), ultrasonography (n = 11, 7.3%), and magnetic resonance imaging (n = 1, 0.6%). Conclusion: This study highlights the burden of MCRI in our environment from a radiological perspective. The need for continuous advocacy on prevention of MCRI in a developing nation cannot be overemphasized. 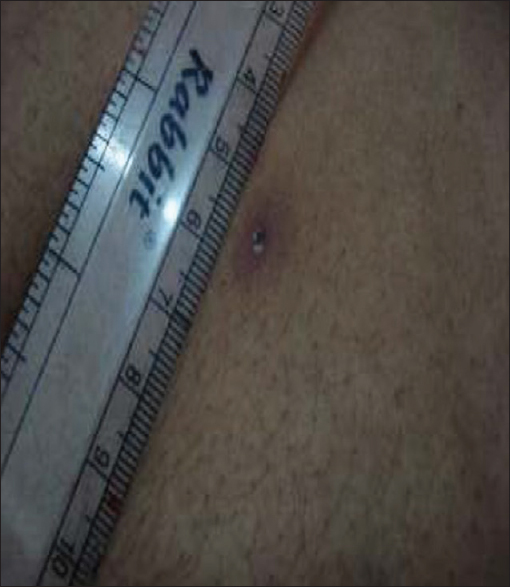 An adult male patient presented with a gradually worsening pain in the left-side of the loin region and on and off fever for 1-month duration. Per abdomen examination revealed fullness in the left renal angle with tenderness over the left lumbar region. His complete blood count showed a slight increase in white blood cell count. His computed tomogram (CT) scan abdomen showed left upper ureteric calculi with a hypoechoic lesion suggestive of a perinephric abscess. A percutaneous nephrostomy was done, and aspirated pus was sent for microbiological analysis, which yielded Salmonella Typhi, intermediate sensitive to ciprofloxacin and sensitive to ceftriaxone. The patient was treated with injection ceftriaxone for 10 days followed by tablet cefixime for another 2 weeks. Primary perinephric abscess due to Salmonella Typhi without any evidence of systemic involvement is rare. We report one such case, diagnosed by CT scan abdomen and culture treated successfully with a combination of surgical drainage and medical management. Extraction of the broken/bent nail will be needed in the revision surgery in cases where the fracture is ununited. A broken nail can be removed easily through the fracture site. However, there is no standard protocol that exists in the literature for extraction of a bent nail. 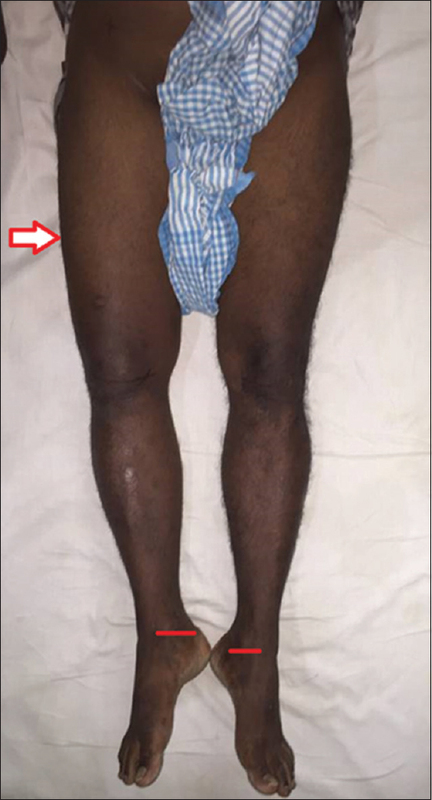 We report a case of 5 weeks postoperative bent intra-medullary (IM) interlocking femoral nail in a 33-year-old male who had undergone nailing for femoral shaft fracture, due to a trivial fall during rehabilitation. 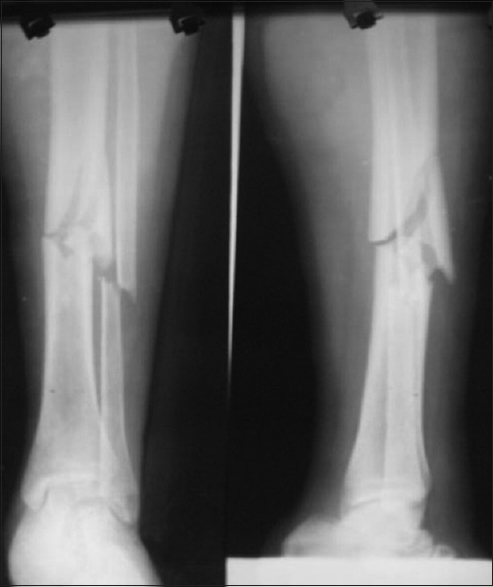 A radiograph of the affected limb revealed that the IM nail was bent to 30° with a varus deformity. The fracture was still uniting. The nail was unbent after anesthesia and exchange nailing was carried out. A closed manipulation should be attempted prior to any surgical procedure, in order to prevent damage to soft tissue, bone and avoid complications that may arise due to extensive surgery. Prozone phenomenon or hook effect has been known to occur while performing enzyme-linked immunosorbent assay. Hook effect has been documented for analytes such as prolactin and beta-HCG. We here report a rare case of prozone phenomenon observed in Vitamin B12 estimation by electrochemiluminescence immunoassay in a patient receiving parenteral Vitamin B12 supplementation. 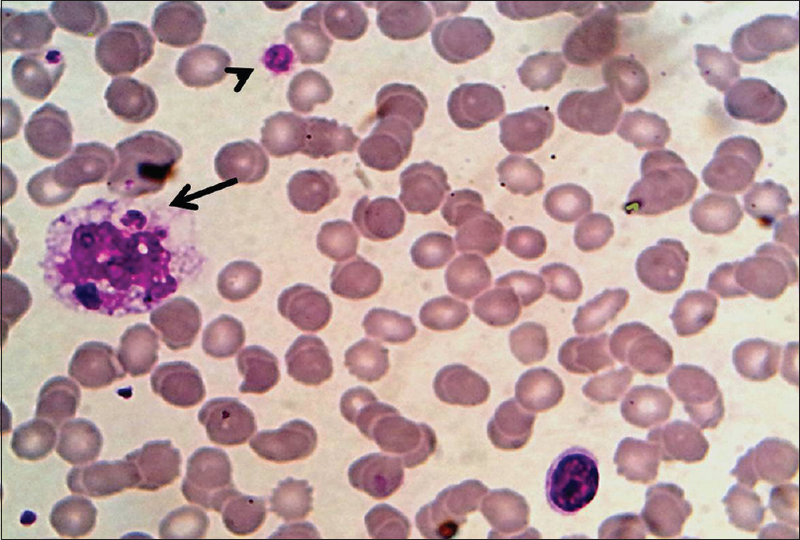 We aimed to describe peripheral blood phagocytosis of platelets as a possible underlying mechanism of thrombocytopenia during the acute phase of dengue virus infection in a young male. Furthermore, enhanced platelet phagocytosis through the apoptotic mechanism is also briefly highlighted. Large B-cell lymphomas are the most common non-Hodgkin lymphoma representing a heterogeneous group of diseases which often pose diagnostic problems in the clinical practice. B-cell lymphoma, unclassifiable (B-UCL), with features intermediate between diffuse large B-cell lymphoma and Burkitt lymphoma, is a poorly defined rare entity. We describe a 59-year-old male patient presented with complaints of bloody nasal discharge for last few months. On examination, a nasal mass was seen. Biopsy revealed a non-Hodgkin lymphoma. The cells are immune positive for CD20, BCL-2, BCL-6, and MUM-1. Ki-67 labeling index was 90% while negative for CD1 and CD5. A diagnosis of B-UCL was made. 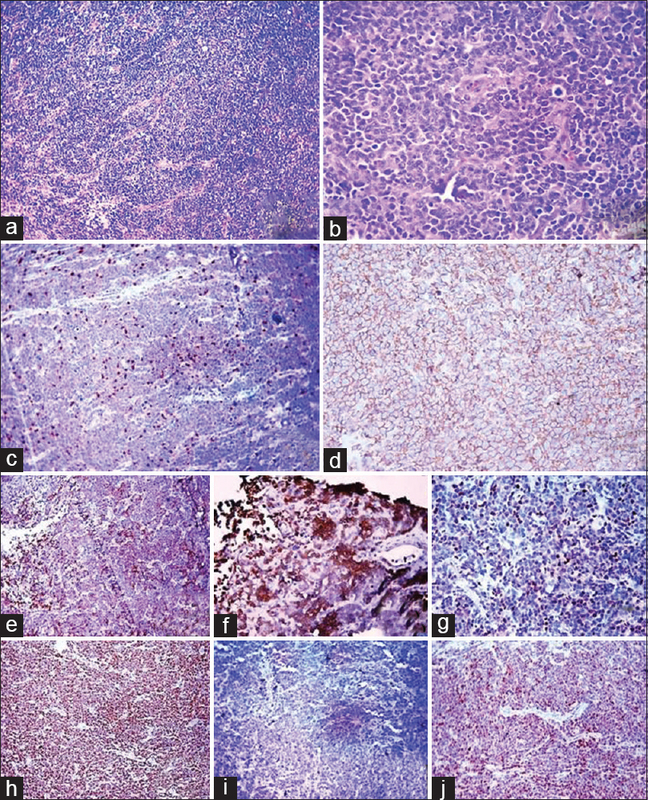 This case is presented due to its diagnostic difficulty among large B-cell lymphomas and emphasizes the need to integrate morphological and immunohistochemical findings. A 63-year-old man with permanent pacemaker implant developed cardiac device related endocarditis by atypical mycobacteria. Infection with rare organisms should be considered whenever the routine culture fail to pick up the causative pathogen. Timely diagnosis and management is essential for these infections. Valproate is one of the commonly used medications for the treatment of seizures. Though this medication is used frequently in the treatment of behavioral abnormalities and aggressive behaviors, rarely it has been associated to cause irritability and other behavioral problems. Access of parents to unsubstantiated easily accessible medical literature in the internet may predispose them to ascribe behavioral problems to medications. We present a case of a 3½-year-old child who was recently started on valproate after seizures and had presented with behavioral problems in the form of irritability, tantrums, and outbursts mainly in the family context after initiation of valproate. We discuss alternate possible explanations for such behavioral problems.